Should I Put Coffee Grounds in a Worm Bin? First off, in my post on using coffee grounds in your garden I linked to the wrong article. 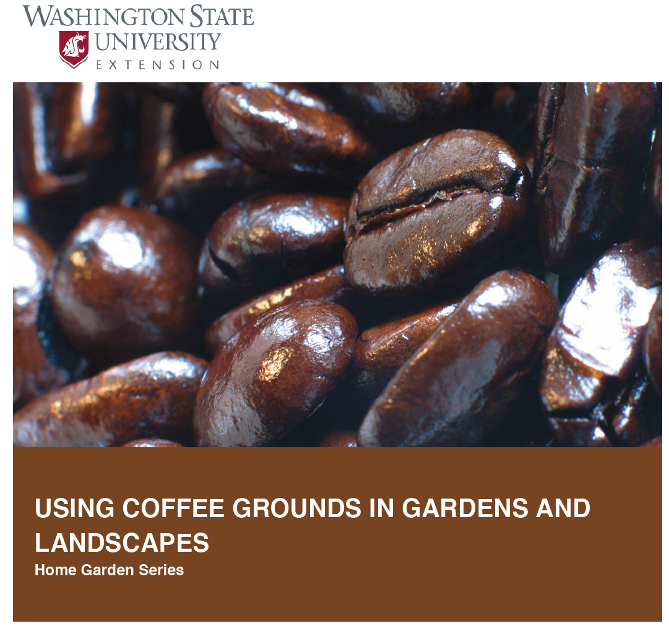 The correct, and very useful publication by Linda Chalker-Scott, “Using Coffee Grounds in Gardens and Landscapes” can be found here. There were a number of questions and emails about the pamphlet’s recommendation not to add coffee grounds to your worm bin. Why might coffee grounds not be good for worms? Chalker-Scott cites a study, “Evaluation of three composting systems for the management of spent coffee grounds” that looked at using worms to compost coffee waste. The study showed high worm fatality in spent coffee grounds due, the authors speculate, to the acidic pH of coffee and harmful organic compounds. The addition of cardboard reduced fatality. They go on to suggest pre-composting coffee grounds for three weeks before adding to a vermicomposting bin. It should be noted that the study was looking at worm bins where the feedstock was entirely made up of spent coffee grounds. Adding a few coffee grounds to a home bin made up of a diversity of feedstocks is probably not going to kill the worms. In the absence of peer reviewed literature as to what percentage is acceptable, the cautious approach is to avoid it altogether, is my takeaway. If and when someone studies the issue to determine a safe percentage, it would be unwise to recommend the practice, given the results of the referenced paper. Coffee grounds also form large anaerobic clumps worms don’t like. Clearly, they prefer vegetable scraps and large amounts of fluffy carbon material like cardboard and wood shavings. Now wouldn’t it be great if Elon Musk would fund local Extension Service home gardening research rather than trying to figure out ways to blast rich people into space? We need definitive worm bin advice! Coffee grounds should be composted before used as a soil amendment but can be used fresh as a mulch. Fresh grounds are phytotoxic, so keep them away from direct contact with roots. Coffee grounds will not necessarily make your soil more acidic. Don’t use coffee grounds where you are starting seeds. Despite rumors, coffee grounds do not repel pests. Let coffee grounds cool before adding to compost bin so you don’t kill beneficial microbes. And don’t let coffee grounds amount to more than 20% of your compost pile. Don’t add coffee grounds to vermicomposting bins. Apply a thin layer (no more than half an inch) of coffee grounds. Cover with a thicker layer (four inches) of coarse organic mulch like wood chips (Chalker-Scott 2015). This will protect the coffee grounds from compaction. Don’t apply thick layers of coffee grounds as a standalone mulch. Because they are finely textured and easily compacted, coffee grounds can interfere with moisture and air movement in soils. What happens to the organic matter you put in the green bin? Where does it go? What could we do with it that could save the world? Kreigh Hampel, recycling coordinator for the city of Burbank, is our guest once again to discuss thinking of organic “waste” as organic “nutrients.” Kreigh was on 042 of the podcast “The Tailpipe of Consumption” to talk about inorganic waste and how it is recycled. 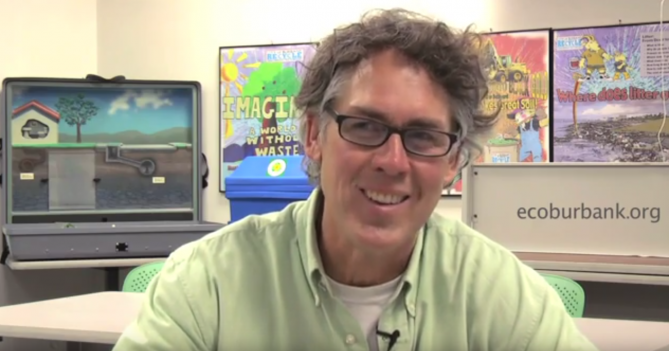 Organic matter and the possibilities it has for transforming our cities is Kreigh’s favorite topic. In this podcast Kreigh outlines the current, unsustainable way we deal with organic matter and ways that we can all help change the paradigm. If you’d like to pick an argument in the mostly staid world of gardening, I can’t think of a better subject than compost tea. I’ve, somewhat cowardly, tried to stay out of the fray and leave the debate to Linda Chalker-Scott and Jeff Lowenfels. If you forced me to pick a side I’d lean towards Chalker-Scott’s skepticism. Thankfully, I can now point towards the eXtension.org webinar on making and using compost teas that I’ve embedded above. I’ll oversimplify things a bit with a few of my own bullet points inspired by what Dr. Lynne Carpenter-Boggs, Associate Professor of Sustainable and Organic Agriculture at Washington State University and Catherine Crosby, a Ph.D. candidate in Soil Science at Washington State University had to say in the webinar. Due to a lack of research no peer reviewed recommendations can be made on the use of compost tea. Nobody agrees on what compost tea is or how to brew it. What kind of compost do you use? Do you have to aerate it? How and for how long do you aerate it? Compost teas have been shown to both solve and cause disease problems. Compost tea shows promise as a fertilizer. If you add sugar to your tea you need to be very careful about food safety issues. You must dilute compost tea before using. The compost going into tea must be mature and of high quality. You might be better off just applying normal compost to the soil. My personal conclusions are that if I were a farmer (which I am definitely not), compost tea might be worth looking into as a fertilizer or, in certain specific circumstances, for disease control. As a home gardener, however, I’m going to wait until there is more research before I spend money on a subject that is still so unresolved. Let us know what you think–leave a comment! On the podcast this week Kelly and I discuss the horticulture and philosophy of the Ridley Scott/Matt Damon film The Martian, which is based on the novel by Andy Weir. It’s apparent that the character played by Matt Damon has read both John Jeavon’s How to Grow More Vegetables and Joe Jenkins’ Humanure Handbook. 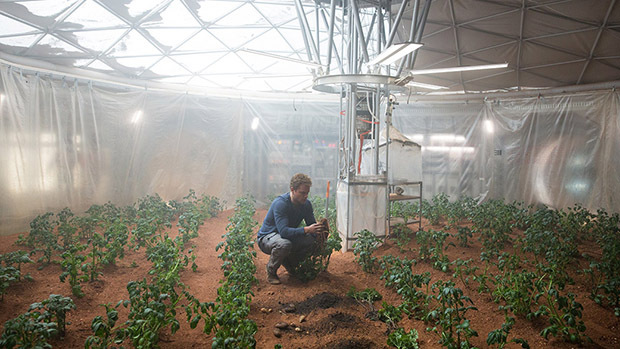 We have many questions about the film: Can you really grow potatoes on mars? Do you need to compost human waste before applying it to crops? Is NASA headquarters actually full of tasteful, mid-century modern furniture? We also discuss some deeper philosophical issues raised by the film. We reference Adam Bartos’ book of photographs, Kosmos: A Portrait of the Russian Space Age and Andrei Tarkovsky’s film Solaris, which you can view in its entirety for free (part 1 and part 2). Here’s the highway scene from Solaris that I mention. If you saw The Martian let us know what you thought of it!